Our power plant of 12.6 MWh. Equipped with two Deutz MWM type BV 16 M 640 engine was inaugurated in early February 1996. Since mid-April 1996 until the time of closure of the plant in January 2011 for fuel oil additive engine "RB BERTOMEU" beco F1/ASF was used for the treatment of fuel consumed in the plant. · The Neutralization of corrosion and fouling waste exhaust valves and turbochargers than doubled the life of valves and turbos. · Increase The service factor for the increase of TBO (time between overhauls) for the longer duration of the exhaust valves and turbochargers. We authorise the use of this letter for reference purposes for your products and services. Signed M. Carmen Cruzado Rodriguez. Director of Ercros. Pharmacy division. 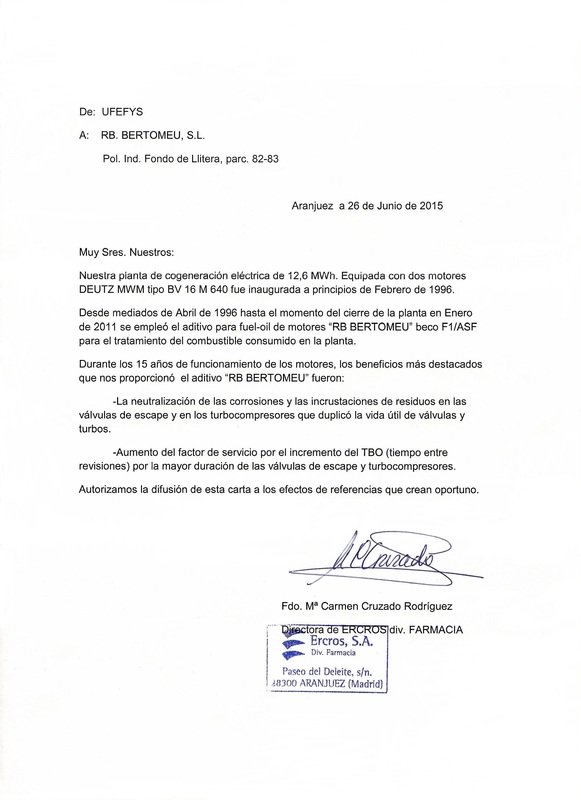 We certify that in the Ufefys co-generation plant, located in Aranjuez (Madrid), we have been using “rb bertomeu” additives for fuel oil regularly and without interruption since the beginning of 1996. After nearly 5 years of using these additives in our fuel oil, especially beco F1/ASF, we are pleased to show our total satisfaction with the technical and economic results obtained from the two DEUTZ engines, type BV 16M 640, in the plant. · A saving in maintenance due to the great reduction of corrosion in exhaust valves and no corrosion in turbos and inlet valves. · An increase in the service of the plant due to the lower number of maintenance and cleaning stoppages, and an increase in the TBO (time between overhauls) made possible by the longer life of the exhaust valves. The long period of production that the plant has had using these additives is a guarantee, as we understand it, of their quality for this kind of installation. As on previous occasions, we authorise the use of this letter for reference purposes for your products and services.